* Bannister House, Match Canal, Merseyside. Sun, 38. 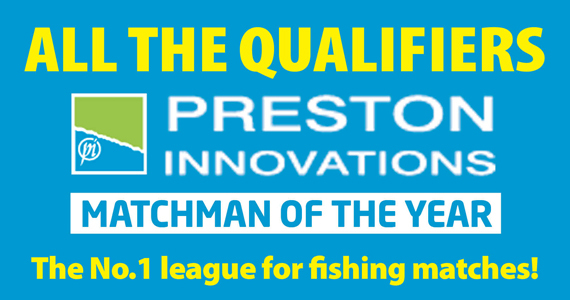 Dave Heaton (Harry’s Tackle) 133-0-0, peg 21, groundbait and red maggot, 13m; Phil Alton (Ted Carter Southport) 125-8-0, Mark Halliwell (Ted Carter Southport) 121-4-0; Paul Hart (Preston) 110-8-0. * Blundell’s, Cheshire. Sat, 33. Gary Whalley (Bait-Tech) 283-2-0, F1s to 3 lb, shallow pellet at 8m, Trio peg 47 new venue record; Stuart Carroll (Leigh Tackle and Bait) 242-0-0; Cliff Noble (Stalybridge Angling Supplies) 200-14-0; Alan Howarth (Leigh Tackle and Bait) 177-9-0. Sun, 40. David Howard (Leigh Tackle and Bait) 96-14-0, carp and F1s to 3 lb, Method feeder with 6mm pellet, peg 6 Trio; Andy Musgrove (Edgeley Sports) 90-11-0; Pete Roys (Leigh Tackle and Bait) 77-14-0; Pete Cunniffe (Gilders) 76-0-0. * Brookside, Snake Pit, Cheshire. Sun, 35. Stuart Taylor (Tackle Saver) 129-14-0, F1s, caster, 11m, peg 56; Gary Moore (Tackle Saver) 103-6-0; Chris Roscoe (Rod & Reel) 101-8-0; Andy Hartley (Widnes) 96-14-0. * Heronbrook Fishery, Slindon, Staffs. Sun, 41, Canal and Match Lake. Danny Hallam (Darlo Design) 142-4-0, all F1s to 2 lb, poled pellet, Canal 32; Anthony Furnival (Stoke-on-Trent) 131-12-0; Dave Brookshaw (TRAC AC) 112-11-0; Tony Weightman (Ted Carter Southport) 109-1-0; Kevin Dennis (Ultimate Pellets) 104-4-0; Anthony King (Ted Carter Southport) 101-6-0. * High Heyes. Lancs. Sat, 34, Lake 3. Richard Yates (Ted Carter Preston) 62-4-0, barbel, maggot at 13m, peg 12; Mark Ellement (Ted Carter Preston) 51-08-0; Mick Threllfall (Rochdale) 46-12-0; Martin Liptrot (Saints) 45-0-0. * Maver Match This, Partridge Lakes, Culcheth, Cheshire. Sat, 107. Andy Geldart (Garbolino/Dynamite.Baits) 134-9-0, F1s and ide, caster shallow at 11m, Ribbon peg 4; Andy Bennett (Diawa Guru) 130-3-0; Adie Twist (Leigh Tackle & Bait) 122-14-0; Jon Arthur (Match Fishing) 120-2-0; Mick Rodgerson (Drennan NW) 118-05-0, Mitch Rawlinson (Fishing Republic) 115-15-0. * Partridge Lakes, Culcheth, Cheshire. Sun, 61. Dave Wells (Tri-Cast Rochdale) 120-8-0, F1s and carp to 6 lb, pole to 6m down edge, worm, peg 63; Mark Wainwright (Colmic) 108-7-0; Mike Reed (Garbolino) 107-4-0; Craig Lealand (Partridge Lakes) 89-8-0; Colin Mayor (Drennan NW) 89-3-0; John Jones (Garbolino Elton) and Danny Ballon (Ashton Angling) both 84-11-0. * Stapeley Crewe Summer League, Trent and Mersey Canal, Middlewich, Cheshire. Sun, 90. Garreth Charnock (Ted Carter Southport) 14-9-8, one chub and roach, poled caster, chopped worm and hemp, Tetton Lane wood; Jason Cunningham (Shakespeare) 11-14-3; Mal Glover (Sam’s Tackle) 11-8-0; Eric Gardner (Team Eclipse) 10-15-8; Derek Bowers (Drennan North West ) 10-8-12; Dave Horton (Browning Lifestyle) 9-7-8. Teams: Ted Carter Southport 66; Maver Midlands 65; Shakespeare Superteam 64; Saints 62; Sam’s Tackle 55; Wolverhampton AA Van den Eynde 54. League: Sam’s Tackle 176; Saints 173; Maver Midlands 171; Shakespeare Superteam 166; Wolverhampton AA Van den Eynde 163; Drennan North West 160. Blundell’s, Cheshire. Wed, 35. Mitch Rawlinson (Fishing Republic) 250-9-0, carp & F1s to 2 lb, pellet shallow at 8m, Trio peg 17; Steve Gallagher (Ted Carter Southport) 230-3-0; Gary Whalley (Bait-Tech) 181-0-0; Cliff Noble (Stalybridge Angling Supplies) 158-0-0. Thurs pm, 16. Sam Slocket (Wayne’s Tackle) 177-12-0, carp & F1s to 2 lb, pellet shallow at 8m, Trio peg 27; Gary Whalley (Bait-Tech) 173-12-0; Chris Weeder (Leigh Tackle and Bait) 144-15-0. Brookside, Snake Pit, Cheshire.Thurs, 18. Ray Thompson (Vale Royal Angling) 166-0-0, carp to 3 lb and ide 2 lb, caster at 10m, peg 9 Snake 1; Dave Pollitt (iurst Tackle) 141-4-0; Chris Ruscoe (Rod n Reel) 134-12-0; Conrad Taylor (Gilders) 101-10-0. Thurs, 17, OAPs. John Sharpe 45-8-0, Willow Lake; Graham Broughton 37-0-0; Alan Provost 32-10-0. Sat, 22. Stuart Taylor (Tackle Saver) 136-0-0, F1s and ide, caster, 11m, peg 14; Jimmy Wilson (JW Pole Repairs) 100-8-0; Ricky Salmon (Brooks) 99-4-0; Jeff Barker (Port Sunlight) 91-4-0. Cudmore Fisheries, Whitmore, Staffordshire. Sat, 24, Pool One. Adam Barnes (Oaks Tackle) 155-10-0, carp to 8 lb plus skimmers, poled pellet, peg 12; Damien Bracken (Mosella Garbolino) 143-0-0; Steve May (Match Scene) 123-0-0; Steve Boyd (Prescott Angling Supplies) 115-8-0; Shaun Hill (Maver Gold/Bag’em) 113-0-0. Hall Lane.Bessies Lake.Lancashire. Sun.42.Andy Bennett (Diawa/Guru) 108-08-0, peg56, 14m pole across on pellet, Carp to 2lb and silvers. 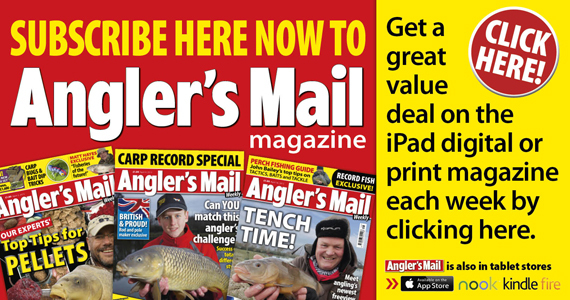 Wayne Kearney (Tricast-Rochdale) 90-02-0, Keith Barton (Wigan Angling) 88-14-0, Bob Watson (Ted Carter Preston) 83-06-0. Hanchurch Fisheries, Hanchurch, Stoke-on-Trent, Staffordshire. Wed, 9, Veterans, Model Canal. Mark Taylor (Trentside Angling Centre) 88-11-0, carp and silvers, poled pellet, peg 43; M. Rhodes (Hanchurch Fisheries) 62-1-0. Sun, 20, Northwood Garden Centre Aggregate, Model Canal , 20. Pete Green (Simon Hartley AC) 115-2-0; carp, poled pellet, peg 13; Vinnie Smith (Tri-Cast Highfield) 110-14-0; Steve Michaels (Tri-Cast Highfield) 102-2-0. Lingmere, Match Lake, Cheshire. Wed, 16, OAPs. Dave Ward (Connahs Quay) 96-10-0, mixed bag, caster & worm at 13m, peg 31; Dave Randall (Lingmere) 76-4-0; Ian Hughes (Lingmere) 70-14-0; Ken Pickle (Eggy Ferry) 70-12-0. Sat, 19. Jack Trainer 88-2-0, barbel and carp, maggot, 14m, peg 7; Dave Woodworth (Lingmere) 78-8-0; Alan Dewhurst (Lingmere) 75-6-0; Dave Ward (Connahs Quay) 65-6-0. Liverpool DAA, Leeds-Liverpool Canal, Jacksons Bridge. Sun, 17. Jeff Stirrett (Ted Carter Southport) 4-8-0, sinhle bream plus silvers; John Easton (Liverpool AS) 4-2-0; Dave Trafford (Sam’s) 3-8-0; Jimmy Elms (Liverpool AS) 3-4-0. Meadow View, Cheshire. Tues, 18, OAPs, Lark Pool. Geoff Wilson (Turnover Tackle) 37-12-0, carp to 6 lb, worm/caster at 10m, peg 25; Dennis Hockwell (Leigh Tackle & Bait) 31-4-0; Les Sandbatch (Ashton Angling) 28-14-0; Jo McNabb (Cossack) 28-6-0. Thurs, 16, OAPs. Thrush Pool. Phil Barwell (Widnes) 59-0-0, carp to 5 lb, pellet at 8m, peg 23; Roger Pete (Oldham Owls) 56-0-0; Ray Ignett (Shaw’s Tackle) 52-0-0; Ken Jefferies (Edgley Sports) 20-8-0. Sun, 18, Lark. Keith Podmore (Ted Carter Preston) 69-4-0, carp to 8 lb, poled pellet/corn, peg 6; Sean Woodward (Danny’s Tackle) 64-8-0; Dave Hancock (Meadow View) 56-8-0; Julie Stokes (Cheshire) 50-0-0. Mill House. Merseyside. Wed, 18, Mescar Lake. John Easton (Liverpool AS) 84-10-0, carp to 10 lb, paste over hemp at 10m, peg 55; Liam Willis (JRS Angling) 71-2-0; Ben Lloyd (Willaston) 59-2-0; Peter Gradwell (Liverpool AS) 51-6-0. Sat, 17. Ken Dooley (Liverpool AS), 68-8-0, carp to 6 lb and bream 3lb, bomb & pellet, peg 53; Dave Phillips (Ted Carter Preston) 51-8-0; Alex Bentley (Ray’s Tackle) 50-10-0; Paul Faraquhar (Liverpool Dockers) 46-6-0. Sun, 22, Mistral Lake. Andrew Molyneux (Mescar) 74-14-0, carp to 6lb, paste, 6m pole; Steve Hargreaves (Burscough) 6108-0, Ian Cowie (Kirkby) 61-2-0, Ken Dooley (Liverpool AS) 60-8-0. Newton-le-Willows AA, Sankey Canal, Lower Pound, Merseyside. Thurs, 22, Over-60s. Geoff Clare (Warrington) 14-3-8, bream to pole and pellet, peg 5; Paul Hill (Widnes) 12-7-0; John Wheeler (Newton-le-Willows) 8-7-0; Mick Collins (Newton-le-Willows) 6-12-0; Mick Collins (Newton-le-Willows) 6-12-0. Sat, 28, Ladies. Vulcan Reservoir. Amy Marcroft (Newton) 2-4-8, roach and skimmers, pole and maggot, peg 14; Dawn Hilton (Leigh) 1-8-8; Emma Hilton Molloy (Leigh) 1-1-0. Sun, 25, Sankey Canal upper pound. Paul Isherwood (Newton), 21-1-0, bream, long pole and caster or maggot, peg 50; Ray Shorrocks (Farnworth) 13-4-0; Eddie Cook (Newton) 7-0-0; Harry Newton (Newton) 5-13-0. Old Hough Fishery, Warmingham, Middlewich, Cheshire. Tues, 9, Boulders Pool. Dale Richardson (Old Hough) 45-4-0, carp and silvers, poled pellet; Ian Cox (Old Hough) 43-2-0; Pete Clements (Barlow’s Tackle) 43-0-0. Thurs, 10, Prospect and Lucky Dip Pools. Frank Bradley (Old Hough) 47-6-0, carp and silvers, poled pellet; Eric Moore (Old Hough) 34-11-0; Phil Cliffe sr (Old Hough) 33-5-0. Sat, 16, Upper Benbo. Steve Butler (Ted Carter Southport) 62-15-0, carp and silvers, poled pellet; Alex Hume (Bay Malton) 58-4-0; Rick Seaton (Old Hough) 52-12-0; Ken Potts (Old Hough) 51-10-0. Partridge Lakes, Culcheth, Cheshire. Mon, 34, OAPs, Chris Weeder snr (St. Helens Tackle & Bait) 91-7-0, F1s, pellet shallow at 6m, Marsh Lake peg 4; Eddie Battersby (Leigh Tackle & Bait) 82-13-0; Ken Weedar (Widnes AC) 55-10-0; Marvin Hide (Tri-Cast Highfield) 53-6-0. Tues, 18. Barry Bush (Lingmere) 131-3-0 F1s & ide, caster shallow at 6m, peg62; Mick Rodgerson (DNW) 126-3-0; Chris Weeder snr (St Helens Tackle & Bait) 120-4-0; Ian Burley (North West Baits) 116-13-0. Wed, 66, OAPs. Vinnie Smith (Tri-Cast Highfield) 75-9-0, F1s and ide, worm, 11m, peg 52; John Wilson (Partridge Lakes) 70-8-0; Chris Weeder snr (St. Helens Tackle & Bait) 66-12-0; Ron Smith (Cheshire Angling) 60-12-0. Thurs, 28, Covey Lake. Andy Bennett (Daiwa Guru) 142-15-0, F1s and carp, meat, 11m, peg72; Steve Openshaw (Lingmere) 132-4-0; Mick Rodgerson (Drennan NW) 131-1-0; Chris Weeder snr (St Helens Tackle & Bait) 129-1-0. Rudyard Lake, Leek, Staffordshire, Sat, 28. Roy Woodvine (Crewe Match & Carp) 48-0-0, bream to 4 lb, tip and maggot; Dave Williams (Atomic Baits) 28-8-0; Phil Murphy (Leigh Tackle & Bait) 28-4-0; Darren Hogg (Edgeley Sports) 21-11-0. St. Helens AA, Carr Mill Dam, Merseyside. Mon, 19. Ged Rigby (St. Helens) 18-2-0, skimmers and bream, groundbait feeder and red maggot, peg 98; Gary Hogan (St. Helens) 14-4-0, Tony Heffernan (St. Helens) 13-8-0; Graham Marr (St. Helens) 11-00-0. Sat, 16. Ged Rigby (St. Helens) 34-0-0, 7 bream to 3lb and 48 skimmers, bread feeder at 30 yards with red maggot, peg 98; Phil Holland (St. Helens) 23-14-0; Kieran Marsden (St. Helens Tackle & Bait) 22-14-0; Gary Hogan (St. Helens) 21-15-0. Stoke City DAS, Shropshire Union Canal, Grubb Street, Stafford. Sat, 12. Dennis Sumner (Bilston Angling Centre) 8-1-3 skimmers, roach and perch, poled squatt and pinkie, peg 1; Fred Cheetham (Team Eclipse) 5-8-9; Dean Williams (Team Eclipse) 4-5-8; Mel Wood (Team GB Four Ashes) 3-8-14.